Geoffrey Hardwick Dodson was born in Rugby in 1892 and christened at St Andrew’s Church on 14 October 1892. He lived with his father Frederick Hardwick Dodson, a sewing machine mechanic, mother Kate, elder brother Albert Frederick, elder sister Dorothy Grace and younger sister Marjorie at 2 Rowland Street, Rugby in 1901 and by the 1911 census the family lived at 4 St Matthew’s Street in Rugby. He spent 5 years in the Volunteers and 3 years in the Territorials in England before emigrating to Australia when he was about 19 years old. He left from London on 3 March 1911, described as a Plasterer on the OMRAH Orient Line to Freemantle, Western Australia. He enlisted for WW1 at Perth on 4 January 1915. He was described as a clerk, 5’6″ tall, weighed 120 lbs with 34″ chest. He had brown eyes and dark brown hair. On 6 January he went to Blackboy Hill Military Training Camp which housed large numbers of Australian Imperial Force before going to battle in a front location in the Middle East. He was a Trooper in the 3rd Reinforcement of the 10th Battalion Australian Light Horse Regiment Reg No 793 and embarked for Gallipoli on 16 May 1915. Sent to No 1 Stationary Hospital Mudros Gallipoli with G.S.W (gun shot wound) Forearm. He was sent to No 1 Hospital Gallipoli on 31.5.15. He had Diphtheria on 22.9.15 and was transferred to Mudros Anzac on 26.10.15. He had Asthma and was admitted at Ghezirah on 27.12.15 and debility on 7 January 1916 at Alexandria. In February 1916 he was in isolation with Diphtheria again at Heliopolis for 8 weeks. He embarked on the Argyllshire and returned to Australia for 4 months change and convalescence. On 7 March 1916 he had developed Thrombosis. He returned on 15 May 1916 as fit for duty from Freemantle on the Clan McCorquodale. On 12 January 1918 he was sent to ‘Rest’ at Camp Port Said and returned on 26.1.18. There was heavy fighting at the ES Salt Raid, Palestine. Geoffrey was killed in action on 2 May 1918. Dates vary on his 82 page soldier’s record. It stated “body unburied every effort made to recover but impossible owing to heavy enemy fire at short range”. 237 soldiers in the 10th Light Horse Regiment were killed. His Victory Medal, British War Medal, and Memorial Scroll and Plaque were sent to his mother with his effects at 4 St Matthew Street Rugby on 14 March 1919. Algernon Sidney Horswill was born 2nd March 1892 to Charles and Fanny Horswill at Coventry, Warwickshire and was baptised 26th December 1892 at Holy Trinity Church Coventry. The family were living at 4 Irby Terrace, Foleshill Road, Coventry and his father occupation is given as clerk. Algernon’s parents were married 18th September 1890 at the Parish Church of St Thomas Coventry. Algernon’s mother‘s maiden name was Burton. On the census of 1901 Algernon is the only child and his father, Charles is working as a clerk in the cycle trade and they are all living at Palmerston Road Coventry in the Parish of St. Thomas Coventry. By the time of the next census, 1911, Algernon and his parents are living in Rugby at 48 Craven Road. Algernon is a teacher for the Warwickshire County Council and his father is a bookkeeper at engineering works. Algernon went as a student to St Marks College Chelsea and where on the 21st October 1912 he signed an Attestation form to serve in the Territorial Force, he was then aged 20 years 7 months and his number on the form was 1319. He saw action at the Battle of Romani 4th – 5th August 1916 and was involved in the Second Battle of Gaza 17 – 19 April 1917, by this date he had been reported missing and was listed as having been killed in action 26th March 1917. Algernon’s service number was changed from 1319 to 290110, and in the Commonwealth War Graves Commission records he is also under service number TF/290110 2nd/10th Bn. Middlesex Regiment and with that last service number CWGC gives the place of his memorial. In the Forces War Record Algernon is under 290110 (late 1319) and he is given as being in the E. E. F. Signal Section and is given as missing 26th March 1917 but with no place of a memorial in their records, under TF/290110 he is given as being killed in action 26th March 1917 and the record names his parents and their address 48 Craven Road Rugby. Algernon’s name is on the Jerusalem Memorial, panels 41 and 42, for those who have no known grave and also on the Rugby Memorial Gates. He was 25 years of age at the time of his death and had never married and was the only child of Charles and Fanny Horswill. Algernon was awarded the Victory Medal and the British War Medal. WHAT A K.O.S.B. THINKS OF THE CONSCIENTIOUS OBJECTOR. DEAR SIR,—Perhaps your readers will be interested in the doings of the 7th Battalion Royal Warwickshire Regiment and the old E Company boys. They are all in the highest of spirits, and are looking the picture of health despite the terrible hardships they have all endured through the trying winter months in mud and water ; and have made themselves feared by their neighbours the Huns. They have also been very highly praised for their splendid work out here by their Commander, and he hopes when the time for them to get to grips with the enemy arrives, they will still maintain the name they have made for themselves since they have been out here. We are getting some sports up this afternoon among the officers and men. We enjoy ourselves when we come out for these short rests, after being in and out of the firing line for a month at a stretch. Hoping you will publish this in your paper, we remain—THREE OF THE OLD RUGBY COMPANY BOYS. Staff-Sergeant W A Simpson, 21st Lancers, who has been awarded the D.C.M for going to the rescue of a comrade and an officer, and holding back the enemy with a revolver, is a Daventry man. He is a son of Mr P W Simpson, and grandson of the late Mr T Simpson, for many years manager of the Daventry Gas Works. An ex-champion Public School boxer, Capt Ian D Dewar, son of Lord Dewar, one of the Scottish Lords of Session, has been killed in action. He had previously been wounded in August and September of last year. Capt Dewar when at Rugby won the Public Schools Lightweight Championship at Aldershot in 1911, and he captained the Boxing Club at Oxford. Mr G H I Cowley, of Hertford Street, Coventry, solicitor, has joined an Officers’ Training Corps on the nomination of Colonel Courtenay, C.B, and during his absence his practice is being looked after by Mr Charles Martin, of 18 Hertford Street. Mr Cowley was educated at Rugby School, and is a member of a family having large landed interests in Northants, and is a grandson of the late Rev Charles Thorold Gillbee, M.A, D.D, for many years incumbent of the joint family livings of Barby and Kilsby. Lance-Corpl Jack Bird, 12th K.R.R (son of Mrs Harris, 41 Now Street, New Bilton), is at present in Christ Church Hospital, Hants, suffering from a fractured collar bone and bruises, sustained as the result of the explosion of an aerial torpedo in the trenches. This is the second time that Lance-Corpl Bird has been wounded. News was received on Monday that Pte Albert W Johnson, 9th Batt Royal Warwickshire Regt, and only son of Mrs Johnson, of 110 Abbey Street, Rugby, a widow, was killed in action on Jan 6th at Cape Holles. Pte Vertegans, also of Rugby, who was in the same section, put a cross, which he made himself, with a suitable inscription and verse thereon, at the head of his grave. The number of men being called up locally has shown a considerable increase during the past week, and about sixty men have been passed through the Rugby Drill Hill. Of these only a small number were conscripts. A notice about the “ starring ” of munition workers was issued by the Ministry of Munitions on Thursday night. In future men will only be exempted from military service if they are actually engaged on war work and can show that they are eligible for War Service badges ; not if they are engaged on private work and may be required for munitions work. Mrs Fidler, of Harborough Magna, has received intimation that her son, Pte William Fidler, was accidentally killed in France on March 7th, Pte Fidler was an old member of the E Company, and until quite recently he was attached to the Horse Transport Section. About a fortnight before his accident, however, he was transferred to the Warwickshire Infantry Brigade Machine Gun Company, and on March 7th he started out with a team of horses, which had recently arrived from a Remount Depot, and a wagon. Ten minutes afterwards he was found lying unconscious in the snow by the side of the load. He was taken in a motor ambulance to a field hospital which was close by, but, he only regained consciousness for a few minutes, and died in the evening. He was a quiet, reliable, and steady soldier, and will be much missed by his comrades. A sad feature is that he came home from the front on leave at Christmas to be married. SERGT BALE TELLS HOW HE WON THE D.C.M. Rifleman F Pee, aged 19, who has been missing since July 30th, has now been reported killed in action on that date. His home was at 391 Clifton Road, Rugby, and before war broke out he worked in the machine shop at the B.T.H. He enlisted in the Rifle Brigade the beginning of September, 1914, and went to France the following May. He was in the liquid fire attack at Hooge on the 30th July, and was not seen afterwards. His name has been put on the Hooge Memorial. INTERESTING LETTER FROM THE BALKANS.-An interesting letter has been received by his friends from one of the sixteen Braunston boys belonging to the 7th Royal Berkshire Regiment, who are now serving with the Salonika Force. After explaining how they were bivouacked on the side of a mountain in nice little dug-outs, and two in a hole, he says :-We are still getting lovely weather, and the hills are covered with wild crocuses, so you can tell it is warm. We get the papers you send, and although the news is a bit old when we get them, we sometimes read them over two or three times when we can’t get any books. I wonder how the Braunston Armlet men will like soldiering. I bet they get a surprise when they start ; but I am pleased they didn’t stay till they were dragged, although they stayed long enough. It is very interesting out here to watch the natives in their mountain villages. They are just as you read about them in the Bible—the old bullock waggons, and shepherds with their crooks, and the women carrying their water pitchers on their heads and shoulders. The men squat about in baggy trousers, and never seem to do any work. They seem quite satisfied to remain as they are, and I shouldn’t think they have advanced a bit for a thousand years. The Prince of Wales’ National Relief Fund.—WASTE NEWSPAPER DEPARTMENT.—The organisers of the old newspaper scheme desire to draw the attention of householders and others in Rugby and surrounding districts to the collections of old newspapers which are being organised by the Boy Scouts Association in aid of the Prince of Wales’ National Relief Fund. Communications should be sent to Geo R Payne, Hon Sec Rugby Scouts Association, 13 Park Road, Rugby ; parcels to either Murray School between 9 a.m and 4 p.m, or B.T.H Troop Room, Lodge Road, 7.30 p.m to 9 p.m, Tuesdays, Fridays, and Saturdays. Only morning, evening, weekly, and Sunday papers are required, Coloured paper is acceptable, but must be bundled separately. DODSON.—In loving Memory of our dear son William Ernest, who died of wounds in France, March 24th, 1915. From his loving Father, Mother, Sister, and Brothers. FOX.—In everlasting love and sweetest remembrance of our dear son, Norman Harry Fox, who fell in action on March 21st, 1915. “ One year has passed, oh ! how we miss him. His sorrowing Father, Mother, Brother and Sisters. Second-Lieut G H Neville, of the Somerset Light Infantry, who has been mentioned in despatches and awarded the Military Cross for Valour. Lieut S L Neville, now serving as second lieutenant in the 2nd Royal Bucks Hussars, served in the Rhodesian Volunteers and Warwickshire Yeomanry during the Boar War and South African Campaign, and more recently in German West Africa. Trooper John Neville, of the Rhodesian Rifles, now fighting in German East Africa after going through the German West Campaign. Tom Neville, who went out to the Boar War with the Warwickshire Yeomanry and received wounds in the arm which incapacitated him from further military service. He is now in Pretoria. Richard (the eldest son), also served in the same campaign, and Benjamin, a corporal in the Imperial Light Horse, has just received his discharge after going through the German West African operations. Lieut S L Neville has just been home to pay a visit to his mother, who now resides in Rugby. In the official list of wounded under date January 8th, the names of Pte M Philpot (3202), Lance-Corporal Robotham (1480), Pte E Blower, and Segt A Oldbury, of the 1/7th Warwickshires, appear. RUGBY SOLICITOR WOUNDED & GASSED. Mr C F E Dean, of the firm of Messrs Pulman & Dean, solicitors Rugby, who joined the 9th Public Schools Battalion as a private, in now in hospital at Eastbourne. While in the trenches he was hit by a gas bomb, and in addition to being gassed was wounded in the leg. The effects of the poison gas have left him somewhat deaf and very weak, but he hopes to recover in course of time. WELL-KNOWN B.T.H. EMPLOYE KILLED IN ACTION. SECOND-CORPL. H. E. GOVETT. We regret to announce that Second-Corpl H E Govett, of the 67th Field Company Royal Engineers, was killed in action on the Gallipoli Peninsula on December 19th. Corpl Govett, who had been employed at the B.T.H. several years, was well-known locally, and was very popular both in the works and the town generally. An Australian by birth, Corpl Govett was educated at Geelong College, Australia, and came to England in 1907 and studied engineering at the Crystal Palace Engineering School. He came to the B.T.H. at the end of 1910 as a special course apprentice, and went through all the departments, including the Drawing Office, and when War broke out he was in the Testing Department. He joined the Royal Engineers as a sapper in September, 1914, and quickly rose to the rank of second corporal. He was a member of the Rugby Club, Rugby Lawn Tennis Club, and the Rugby Golf Club, an enthusiastic motor cyclist and all-round good sportsman, and during his stay in the town he made many friends. News has been received in Rugby from an authentic source that the W E Edgcombe, who was amongst those who went down on the S.S. Persia, which was torpedoed in the Mediterranean recently, was Mr William Edward Edgcombe, who was formerly assistant to Mr G W Walton, locomotive foreman at Rugby. Mr Edgcombe, it appears, held a post in India after he left Rugby, but he paid a visit to England about two months ago. The news of his death, in such tragic circumstances, will be deplored by those who knew him in the town, and sympathy will be felt with the bereaved relatives. TWO RUGBY TERRITORIALS GAIN THE D.C.M. Rugbeians will learn with pleasure that two members of the old E Company, 7th R.W.R, have been awarded the Distinguished Conduct Medal for brave conduct in the field. The men thus honoured are Sergt W T Bromage, who, at the commencement of the war, was employed at Nuneaton Railway Station, and Pte L G Eaton, son of Mr. Eaton, of 93 South Street, Rugby. Rugby may well be proud of such men, who have added lustre to the fame of the old “ E ” Company, and all will join with us in congratulating them. Pte Eaton, who is only nineteen years of age, has also been awarded the “ Croix de Guerre ” by the President of the French Republic in recognition of his service. He has resided with his parents in Rugby for eight years, and has been a member of the battalion for nearly three years, being formerly in the Leamington Company. When the war broke out he was employed as a cleaner in the L & N W Railway Company loco department. About fifty men have attested under the Group System at Rugby during the past week, the proportion between married and single being about equal. The cavalry and several other units are now open, and men whose groups have not yet been called up can join these if they come up to the standard by signing up for immediate service. During the past week a number of men have availed themselves of this privilege. All men wishing to join under the Group System must take their registration cards to the Drill Hall. In future the Drill Hall will be closed at 4.30 p.m. on Saturdays. The Rugby Fortress Company—now designated the 220th Army Troops Company—have now gone out of the country. A portion of the company has been sent to the East. At a special quarterly meeting of the Rugby No 2 Branch of the Amalgamated Society of Engineers, held on Friday evening last week, a discussion took place on the Government’s Compulsion Bill. A vote was taken, and it was unanimously decided to oppose conscription under all considerations in view of the fact that, in the opinion of those present, a case had not yet been made out to justify such a measure. Another resolution, calling upon the Rugby Trades and Labour Council to summon a meeting of the rank and file of the unions, to be held in the largest hall available, was also passed, as it was thought that the ordinary members, as well as the delegates to the Council, should have an opportunity of debating and deciding on the matter. W Burton, Hillmorton ; S Fisher, Chester Street, Rugby; Joseph Lane, Harborough Magna ; and E Lima, 52 Pennington Street, Rugby, were summoned by the B.T.H, Rugby. It was alleged that Burton absented himself at Christmas time, and he replied that he was ill. He was told that for not sending in a medical certificate to the firm he would be fined 5s. The complaint against Fisher was adjourned to see how the defendant went on, the Chairman advising him to give up the drink. Lane was stated to have absented himself from work, and was said not to have returned to his employment yet. The defendant, a boy, said that he gave notice to the firm that he was going to leave, and the Chairman pointed out that leaving after giving notice was not an offence. The firm stated that the youth had started work elsewhere. The Chairman said he was not entitled to do that, but must wait six weeks. The case was dismissed without penalty, the Chairman remarking that defendant had probably got his new master into trouble by getting work with him, and it would be for the B.T.H to take what steps they wished against the firm. Lima was fined 15s for absenting himself without leave. MAKING AMENDS TO THE B.T.H. A short time ago an article appeared in a Sunday paper which conveyed the inference that the B.T.H, Rugby, was included in the ramifications of the great German Trust known as the A.E.G. The B.T.H Company at once took steps to deny that they had anything to do with the German Trust, and commenced an action for libel against the newspaper and the writer, “ John Briton,” of the article. When I wrote last on the German influence in the electrical industry, some two months ago, I gave an account of the extraordinary ramifications of the great German Trust, called briefly the A.E.G of Berlin, and in this connection, before I go further, I desire to clear up an unfortunate misunderstanding. Among the “ Allied and subordinate ” companies of which I gave a list, I mentioned the British Thomson-Houston Company of Rugby. I did not say that this company was owned or controlled by the A.E.G, but this inference has been drawn from my article, and I therefore desire to say that it is unfounded. The truth is that the B.T.H of Rugby is mainly controlled by the General Electric Company of Schenectady, which in its turn is a descendant of the Thomson-Houston Company of America. The Thomson-Houston Company in its day sold its European patents to a number of companies on this side of the Atlantic, some of which in due course were absorbed by the A.E.G and some by the G.E Company. The British Thomson-Houston Company belongs, as I have said, to the latter category. It is true that the A.E.G purchased the German rights under the patents of the G.E Co and B.T.H Co in exchange for the American and British rights under its patents, but I am glad to be able to state that the German company has no control over, or interest in, either the American or British company, and I regret if any other meaning has been read into my article, and if any harm has been done to the B.T.H Co thereby. I am also able to state that the A.E.G has no control over the electric lamp business in this country, but, on the contrary, by reason of British patents, it was obliged to purchase from British companies all such lamps as it sold here. EMPIRE CIGARETTES – THEN BACK TO THE TRENCHES. Dear Mr Morris,—At last I am able to acknowledge receipt of your kind gift of 6,000 cigarettes to the Rugby boys of old E Company. They arrived on the 11th, so must have been delayed considerably in transit. I was able to distribute them very quickly, as both the Transport and Maxim gunners were within easy reach. All the boys wish me to express their grateful thanks to you for your kindness, and many, I know, are writing to thank you personally. When your gift arrived we were on the last day of a week’s rest in a little French village some three miles from the firing line. It was an exceedingly enjoyable week, and greatly appreciated by all. Duties were as light as possible. The weather was fairly fine, football matches were arranged and played, and in the evenings concerts were promoted. All these, with the relief from fatigue and tension which is ever present in trench warfare, helped to make us a happy crowd. I think it was the most enjoyable week we have spent out here. The following day we returned to the music of the guns and the one hundred and one trench duties. This morning our artillery opened a heavy fire on the German trenches and barbed wire, which soon drew a spirited reply from the Boches, and for an hour and a half the ground and air vibrated from the roar of cannon and bursting shells. A four-inch shell fell on one of our company dug-outs; fortunately it did not burst, otherwise I am afraid eight of our men, would have had a bad chance. COMFORTS FOR RUGBY SOLDIERS & SAILORS. FORMATION OF A TOWN COMMITTEE. DEAR SIR.—It has been suggested that the men from Rugby who have enlisted in units other than local Territorial ones should be included in a scheme to send them tobacco and other small comforts which they may need from time to time. For some months past Mrs West and Mrs C P Nickalls have been sending parcels to the men of the Rugby Howitzer Battery and the Rugby men of E Company, 7th Royal Warwicks, and many appeals have been received from men in other units with which they have been unable to deal owing to the lack of funds. A representative committee has now been formed to deal with the matter, and subscriptions, which are urgently needed, may be sent to the treasurer, Captain Thomas, United Counties Bank Ltd, Market Place, Rugby, or to myself addressed to the Benn Buildings, Rugby. The neighbouring towns and villages have all been looking after their fighting men for some time past, and it is felt that Rugby should not be behind. It is a fact that the men most keenly appreciate not only the little comforts sent to them, but more particularly the kind thought of their fellow-townsmen which prompts the sending of the parcels. The committee has been made as representative as possible, and includes nominations from all the large works and trading institutions, the Trades and Labour Council, and the School (two, house masters). From this committee an executive has been formed, consisting of Mr J J McKinnell, chairman ; Capt Thomas, United Counties Bank, hon , treasurer; Mrs West, Bawnmore, Bilton, hon secretary; Mrs Cecil Nickalls, Mrs Thomas, Messrs A Adnitt, W Flint, F E Hands, G Gauntley, and W F Wood. The Women’s Volunteer Reserve are acting as the hon secretary’s clerical staff. The methods under consideration for raising funds are :- A flag day, special entertainments, collection funds at all the large works and by employers of labour, subscription lists at the banks, and a house-to-house collection, for which, if possible, use will be made of the organisation which was set going for the Prince of Wales’s Fund. Thank God ! arrived at last. A deep sigh, a fleeting glance up and down as the weary, mud-stained soldier in his bearskin jacket, his knapsack, carbine, and full active service kit, steps on the platform, but as he sees the old familiar objects his face lights up with a smile. He knows full well it is home, dear old home. It does not dismay him that he has to trudge nine or ten miles to seek that sacred spot, “ home,” which has been ever in his mind during the 14 weary months of hardship and danger spent at Ypres, Loos, and Neuve Chapelle. And so they trudge cheerfully off, although no friends are there to meet them with a welcome at the station. I am sure there are scores of kindly disposed persons in Rugby owning motor cars who would gladly meet those war-worn soldiers who have been fighting so gallantly the fierce and callous enemy. I am sure such an influential body as the Chamber of Trade might well take the matter up and add considerably to their laurels. I have met local soldiers arriving at Rugby between 10 and 11 p.m. who have had to trudge to Marton, Long Itchington, Swinford, and some have even walked to Nuneaton in their anxiety to lose a minute in seeing their dear ones at home. It would not be a difficult matter to post a list of those sympathetic people owning motors or tri-cars at the L. and N.-W. Station, who are willing to give our brave lads a lift. There is a public telephone at the station with which to communicate to the town quickly, and, could this be accomplished, I am sure it would earn the heartfelt gratitude of the mud-stained lads from the trenches. Thanking you, Sir, in anticipation, yours sincerely, J. TWYFORD. Albert William JOHNSON was born in Harlesden [1911 census], or Willesden [1901 census], London, in about 1894. The two places are only half a mile apart and both in North-West London, not far from the present Wembley Stadium. He was the only son of Mary Ann Johnson, who was born in about 1862 in Rowley Regis or Dudley, Staffordshire. Johnson is a common name in Rowley Regis, with many of the Johnson families in the area having been ‘chain makers’; her early life has not been traced. However, with three children born in London, she must have lived there, at least between about 1885 and 1901, before coming to Rugby. Albert had two sisters: an older sister, Alice A Johnson, was born in about 1886 in Paddington, and a younger sister, Grace M Johnson, born in about 1897, also in Willesden. The family had moved to Rugby before 1901. In 1901, the four of them were living at 185 Oxford Street, but by 1911 they had moved to 110 Abbey Street, Rugby. Mary Anne was now listed as widowed [she had said that she was married in 1901, although there was no trace of her husband] but had apparently been married for 26 years with 3 children, only two of whom were now living. This information was deleted as not required by the enumerator, but is now useful none the less! It seems that Albert’s sister, Alice, had died, probably in later 1904, aged 18, and recorded as Alice White Johnson. Albert was now a Power Motor Assembler, and Grace, although only 14 was a Meter Assembler, both at an ‘Electrical works’ with BTH added in pencil. By searching for this sister, Alice White Johnson, in London in the 1891 census, his mother, Mary, confirmed as born in Dudley, was also found. They were then living at 63 Wendover Road, Willesden, Middlesex. Mary Anne was recorded as married, although again there was no sign of a husband. Grace was six, and also staying was a visitor, Julia White aged 24, some nine years younger than Mary, and also born in Dudley – she was likely to have been her sister, and this suggests that a maiden name Mary Anne White might be appropriate. To date no suitable marriage has been found with the ‘missing’ Mr. Johnson. 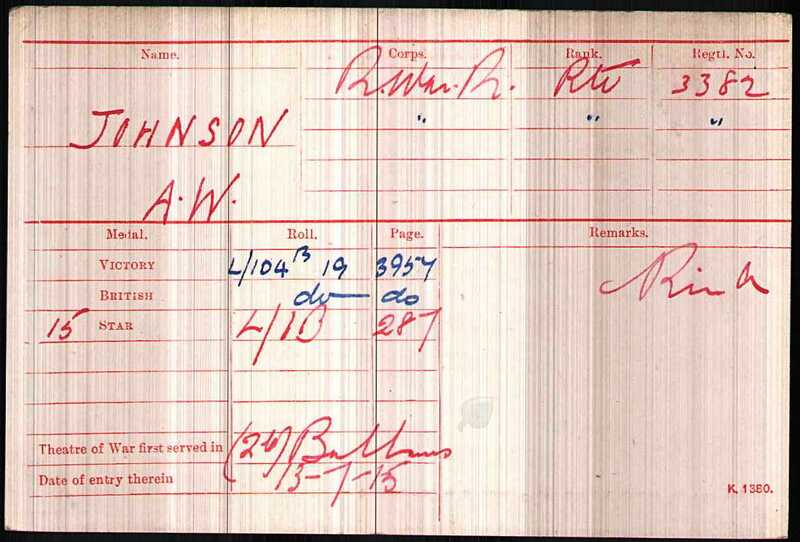 Albert Johnson joined up as No.3382, a Private in the 9th Battalion of the Royal Warwickshire Regiment. It is not known when he joined up, but the 9th (Service) Battalion was formed in Warwick as part of the First New Army (K1) in August 1914 and then moved to Salisbury Plain and joined the 39th Brigade of the 13th Division. In January 1915 they moved to Basingstoke and then to Blackdown, Aldershot. The Gallipoli campaign was in difficulties ‘… a great reinforcement would be required. … during June and July three divisions of the New Army and two Territorial Divisions were sent out from England. Amongst them came the 9th (Service) Battalion of the Royal Warwickshires … On June 17 [or 24], the 9th Royal Warwickshire, … embarked at Avonmouth, and reached Mudros, in the island of Lemnos, on 9 July. Four days later they landed on Beach V. near Cape Helles …’. This agrees with Albert’s Medal Card which recorded that he served in the ‘(2b) Balkans’ from ‘13 July 1915’ – so it would appear that ‘overseas service’ and the associated additional allowances or pay, did not apply until soldiers actually landed in the combat area ‘overseas’ – the voyage it seems was treated as UK service! The Division – and presumably Albert – was engaged in various actions including: the Battle of Sari Bair, the Battle of Russell’s Top, the Battle of Hill 60, and the last Turkish attacks at Helles. ‘On July 29, the battalion returned to Lemnos, and on 3 August embarked again for Anzac Cove, where they were to take part in the impending great attack. … The 9th Royal Warwickshire, … landed in the early morning of 4 August. During the first two days … they were in divisional reserve, but … on 8 August they crossed Bauchop’s Hill to the ridge beyond, part going to relieve the 9th Worcester at the head of Aghyl Dere. The crisis of the attack came on 9 August with the assault of Koja Chemen. Three battalions – the 9th Royal Warwickshire, the 6th South Lancashire, and the 6th Gurkhas – reached the crest, whence they could look down on the waters of the Dardanelles and seemed to have victory in their grasp … when the Turks rallied to a counter-attack our men were forced back to the lower slopes from whence they started. One company of the Royal Warwickshire held on, till they were surrounded, and, as it is supposed, all perished … But the brief space when the men of the Royal Warwickshire looked down on the Maidos road was the nearest approach to decisive victory which the British in Gallipoli were to achieve …’. 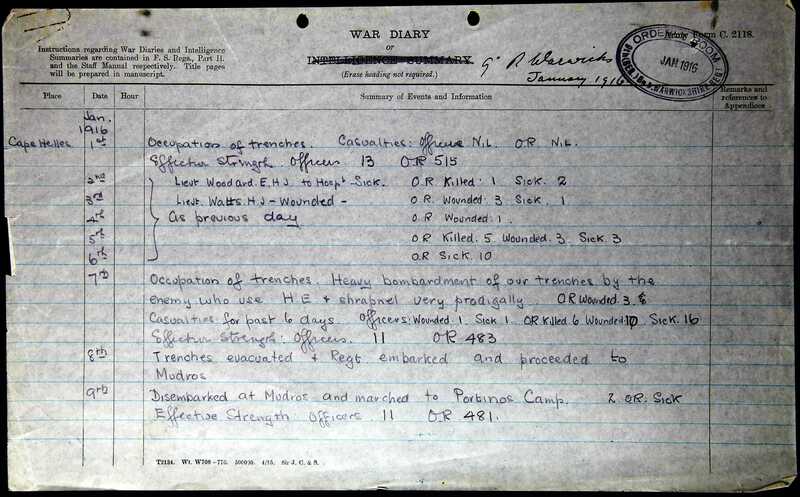 The ‘War Diary’ showed that on the 5 January, ‘O.R. Killed. 5’, as well as ‘Wounded 3. Sick 3’. The other casualty of the six was on 2 January, and searching the CWGC website suggests this was Albert’s colleague, Private Kenneth Marshall No.13237. It seems likely that Albert was one of the five men killed on 5 January during the assistance with the ‘successful’ evacuation. Albert was awarded the Victory and British War medals and the 1915 Star. It seems that his grave was subsequently lost and Albert Johnson is one of the 20,882 casualties remembered on the Helles Memorial who have no known grave. He is also remembered on the Rugby Memorial Gates and on the list of BTH Employees Who Served in the War, 1914 – 1918, but for some reason he was unfortunately omitted from the BTH War Memorial. This article was written for a Rugby Family History Group [RFHG] project, by John P H Frearson and is © John P H Frearson and the Rugby Family History Group, December 2015. The birth of an Alice White Johnson was registered in Paddington in Q1, 1886 [Paddington, 1a, 75] – the only other Alice Johnson registered in Paddington in that period was an Alice Mary in Q3, 1887. This appears to be Arthur Vertigans, born 1892 in Fakenham, Norfolk, No.3280, 9th R.War.R., whose medal card shows that he also went to the Balkans on 13 July 1915; his father came from Sculthorpe, Norfolk. He should not be confused with Arthur J Vertigan, born in 1894 in Kempston, whose family lived in Rugby at least for the 1901 census and who served in the 1/7th Battalion R.War.R. as No.1458 and later as No.265092, in France; his father was born in Burnham, Norfolk and the family came from Tatterford, only four miles from Fakenham. Both families thus had close connections to a small area in north Norfolk and may have been related. This being the list of names on the BTH War Memorial when it was unveiled, as listed in the Rugby Advertiser dated 4 November 1921. Earl Poulett is gazetted a temporal captain in the Warwickshire R.H.A (T.F). Mr Harold Eaden, solicitor, Rugby, has enlisted in his group under Lord Derby’s scheme. Lance-Corpl N H Priday and Pte F Foss, of the 1/7 Royal Warwickshire Regiment, have been nominated to commissions, the former in the West Yorks (the Prince of Wales’ Own) and the latter in the East Yorks Regiment. Mr W J Penn, son of Mr W Penn, farmer, of Wootton, has been gazetted second-lieutenant in the 12th Battalion Welsh Regiment, Nov 3rd. He is an old Northampton and County School boy , and of St John’s College, London. He has been Headmaster and Scoutmaster of Norton, near Daventry. Sergt W C D Miles, son of Mr and Mrs Miles, of Catthorpe, has received a commission in the Westminster Dragoons. He is son-in-law to Mr and Mrs T C Thompson, of Murray Road, Rugby, and was a draughtsman on the Willesdon staff of the B.T.H Company when he enlisted, soon after war broke out. Previous to this, Lieut Miles was in the Drawing Office at the B.T.H at Rugby. PTE H DYER, OF DUNSMORE, KILLED. News has been received at Dunsmore that Pte Henry E Dyer, who left his employment in the gardens at Dunsmore House to enlist in the 10th R.W.R last December, has died in Reading Hospital from wounds received at the Front. Pte Dyer, who was a native of Gloucestershire, and was 24 years of age, was wounded in the head and groin by a bomb while in a trench in France on September 6th, and succumbed to his injuries ten days afterwards. He had been at the front about two months when he received his fatal injuries. Pte Dyer had worked at Dunsmore Gardens for nearly a year before enlisting. Pte H F Baker, R.A.M.C, has been invalided home from the Dardanelles, and is now in hospital at Brighton. Amongst other things in a very interesting letter to his old headmaster, Mr Hodges, he describes the passing of the Rock of Gibraltar on the way home, and says : “ The top of the rock was hid from view by great white clouds. The peaks on the mainland were gilded under the sun’s rays, making a fine contrast.” He mentions that he met Arthur Webb, Lower Hillmorton Road, at Mudros, and adds that he looked very well. Two members of the Murray School Staff have enlisted-Mr J H Fazakerley in the R.A.M.C, under Lord Derby’s scheme, and Mr A L Westbury in the R.E at Chatham, to which place he proceeded on Tuesday last. LETTER FROM OLD ST MATTHEW’S BOY. WHY SO MANY MEN ARE MISSING. “ We had the heaviest shelling from the Germans last week, but luckily our casualty list was all right, although the parapets were badly knocked about in places. We were just over a hundred yards from the German lines, so you can imagine that we were not over-anxious to look over the top during the day, for their snipers are very hot shots. It is very quiet all along our front now, and one would hardly think that a big engagement had taken place so recently as Sept 25th. The only remaining indications of a fight are the dead bodies between the lines, and these have to stop there, as it is so dangerous to go out to find the names, and that is what makes the missing list so great. We have sent out patrols nearly every night to find out any details about the bodies, but it is very difficult work and not very pleasant. One fellow went out and, losing his way, nearly walked into the German lines. They opened fire on him, but he happened to drop into a shell hole, and there he had to stop until the early hours of the morning, when the firing dropped off. We happened to be in the firing on September 25th, and quite expected to go over the top, but our luck was out, and we had to cool our heels and wait, in case the Huns counter-attacked, but we were also disappointed in that. The bombardment previous to the attack was terrible. We could only see the German lines for five minutes after the guns started, but in that short time we could gather some idea of the destruction our guns were causing. About an hour before the attack started, it began to rain, and when the first soldier went over the parapet the ground was like a bog, but that did not prevent our fellows from charging impetuously. Since then it has developed into an artillery duel again. The French are still bombarding very heavily, and at night the sky is lit up all the time by the clash of the guns. Sergt Robinson, who is only 20 years of age, is a grandson of Mrs Robinson, 50 Manor Road, Rugby, and nephew of Mrs Lewis, 74 Manor Road. He came to Rugby six years ago, and was employed as an engine cleaner on the L & N.W.R. He was in the Special Reserve of the Royal Warwicks, and was undergoing his annual training in the Isle of Wight when the war broke out. He transferred to the Wiltshires, and went out to France in May last. He was promoted to the rank of Sergeant on the field, and has also received the French Military Medal. WARMER CLOTHES FOR THE KILTED TROOPS. Fur or leather (flannel lined) jacket. In addition, gum boots reaching to the top of the thigh are provided for men actually in the trenches. The special needs of the kilted regiments have not been overlooked, and auxiliary warm clothing is provided for them. The authorized scale of equipment, we are informed, allows two shirts and four pairs of socks for each man. From time to time complaints reach this country that men in this or that battalion are in want of socks and shirts ; and appeals for these articles or money for purchasing them are advertised. It is stated on good authority that there is no real necessity for such appeals, as ample Government supplies are available to meet all demands made through the proper channels. Mufflers and mittens, however, are not a “ Government supply,” and the making, purchase, and collection of them is a field in which the generosity and industry of the public will be warmly welcomed. We have received very generous contributions from supporters of the Howitzer Brigade, but very few from supporters of E Company. The weather in France is now very bad and the cold intense, in addition to which men have to walk or stand about in 18 inches of mud and water ; this is confirmed by a commanding officer on leave this week. We hope to send every man from Rugby a Christmas parcel of groceries, etc, and a warm Christmas present, but this cannot be done without better support from the friends of the units. If every subscriber and old member of each unit would help, we could do much to help our gallant Territorials spend a happy Christmas.—Yours faithfully. H G King, 34 Campbell Street, New Bilton. A H Harwood, 24 Gas Street, Rugby. T W Barrett, High Street, Hillmorton. G Clarke, 42 Bath Street, Rugby. W H Benjamin, Rowland Street, Rugby. T Whiteman, 16 Winfield Street, Rugby. Frank Boswell, Brook Street, Fenny Compton. Geo Bradshaw, Hillmorton Wharf, Rugby. W T Jeffs, Smith’s Lodging House, Gas St, Rugby. T Greasley, 108 Wood Street, Rugby. H Moore, 47 Sandown Road, Rugby. A E Randall, 58 Manor Road, Rugby. S Reader, Barrack Hill, Ravensthorpe, Northants. S L Webb, Lawrence Sheriffe Cottages, Brownsover. W T Cox, Ashby St Ledgers, Northants. John Robertson, 73 Heavy Tree Rd, Plumstead. Geo Atkins, 70 Church End, Evers Holt, Woburn, Beds. J Gurden, 22 Sandown Road, Rugby. J Wilson, 68 Nelson Road, Paisley. LETTER FROM OLD ST. MATTHEW’S BOYS. It is always a pleasure to receive the Advertiser and read of the doings of the “ old boys.” St Matthew’s has indeed contributed its quota, and I feel proud to be included amongst the number. We, in company with the 11th Division, took part in the new landing on the Peninsula. As you are aware, we did not quite achieve our object, but I feel sure that the surprise landing demoralized the Turks, who were anticipating an attack from the Asiatic coast. It seems to me that people at home are only just beginning to realise the gravity of the situation. The fighting out here is of a different character, and on a different scale to that in France. I think Mr Winston Churchill aptly described the position when he said, “ The armies there are like men fighting on a high and narrow scaffolding above the surface of the earth.” We must indeed be prepared to make great sacrifices before the final goal is reached. I will not trouble you with details of the new landing. We certainly had an exciting time, and for the first ten days had to work like Trojans, We were generally up at 3.30 a.m, and walked fully three miles to the Regimental Aid Post to collect the wounded. Motor or horse transport was out of the question, as there were no roads, and the ground generally very rough and treacherous. It was a poor sort of “ joy ride ” the patients had, yet I cannot call to mind, a single word of complaint. The Warwickshire Yeomanry came along a fortnight after the landing was made. They acquitted themselves well in their first engagement, for it was no easy task to cross an open plain with shells bursting thick and furious. They helped to carry out a good piece of work, and all honour due to them. We have had a splendid opportunity of watching the Navy at work, and can fully appreciate their good work. Without their aid it would be absolutely impossible to land, let alone exist, on the Peninsula. For the present we have turned our back on the Peninsula, and are now in a different country, where we await orders. Mr Censor will not permit me to disclose our whereabouts, so I must leave you guessing. E Division, Hut 1, Eastbourne. DEAR SIR,—I am writing to ask you if you would kindly be good enough to insert this in your paper, as you see by the above address that I am writing this from a convalescent hospital and pleased to say that I am progressing favourably. I should, however, like the people of Rugby to know how the boys answered the country’s call last August ; as near as I can say about 100 enlisted in the 5th Oxford and Bucks, and I am pleased to say there are still some of them left, although, perhaps, few. We had what they call our baptism of fire on June 16th while waiting in reserve for the 6th Division. Here we lost one officer and 50 N.C.O and men whale taking over the position on June 19th. I might say I unluckily got gassed and somewhat blinded, and was away from my regiment six weeks. When I did rejoin on August 17th I luckily escaped a shell, which burst only a matter of a few feet off ; but on September 25th I was wounded and now I am enjoying my convalescent rest. I tell you it is not really so bad being a soldier, and if this letter should reach the eye of any “ slacker,” I hope it will have some effect in changing his mind, for I can assure them that men are wanted and will be had. So play the game and join. We reproduce a photograph of Alfred Charles Hayward, son of Mr H E and Mrs Hayward, of 38 Winfield Street, Rugby, who is, we understand, the youngest of Rugby’s Territorials. Before the outbreak of war he was attached to E/Company of the 1/7th Warwickshires, and went with them to Rhyl for the annual encampment during the August Bank Holiday week in 1914. He was then within a month of being 14 years of age. As will be remembered, the battalion had scarcely, arrived in camp when they were ordered to mobolise at their war station in the south of England. They were eventually moved by stages to Leighton Buzzard, from whence they had a route march of 135 miles through Dunstable, Hitchin, Ware, Epping, Brentwood, Stock, Chelmsford, and other places to Totham. This occupied 11 days, and the distances covered each day ranged from 3 to 20 miles. On another occasion they went out on a three days’ march. Young Hayward marched with them, and never had to fall out. The sight of such a youngster striding along with the regiment naturally attracted much attention from spectators, and if is said that sympathetic mothers were often moved to mingle tears with admiration. He was medically examined and reported fit, but not old enough for active service, and when the battalion went to France, Bugler Hayward returned to Coventry to act with the reserve lines. He is still there waiting for the time when he can go on active service. It would be interesting to know whether there if a younger territorial in the country. Lance-corporal Arthur Mason, 6th Oxford and Bucks Light Infantry, who has been spending eight day’s leave at his mother’s resident 40 Rutland Gardens, Hove, returned to Flanders on November 6th. Mr J Walker, of 58 Lawford Road. Rugby, who went to East Africa with Colonel Driscoll’s Legion of Frontiersmen in April, is now serving as second-lieutenant, the promotion dating from September 8th. It is reported that six members of the 1/7th Royal Warwickshire Regiment-the County battalion—have been reported for Distinguished Conduct in the Field : Second-Lieuts Brian Ash and Sherwood ; Pte P W Hancocks (a Warwick man), Lce-Cpl Berry, Sergt Gerrard, and Q-M Shepherd. A considerable number, of the clerical staff at the London and North-Western Railway Company’s works at Crewe have received permission to join the colours, and their places will be taken temporarily by women. Many of the unmarried men are enlisting under Lord Derby’s group scheme. Mr H Pratt, of 4 School Street, Rugby, has enlisted in the Royal Flying Corps, and left Rugby for the Farnborough Flying Station yesterday (Friday) morning. Since it was drafted to the front in June last, the 5th Oxon and Bucks Light Infantry, in which many Rugby and district men enlisted, has been continuously engaged in strenuous work in an important position of the British line where fighting had been most desperate, and it has nobly upheld the glorious traditions of this famous regiment. The casualties have been exceptionally heavy, and are as under : Officers killed, 13 ; wounded, 19 ; N.C.O’s and men killed, wounded, and missing, nearly 900. Corpl Fred Clarke, who carried out instructions to summon a doctor to attend his Majesty the King on the occasion of his recent accident in France, has been recognised by Hillmorton people from his portrait in a pictorial paper as a soldier of the same name who at the time he enlisted resided in the village. Pte Percy Woodhams, of the 2nd Oxford and Bucks Light Infantry, is reported to have been missing since September 25th, the date of the great advance by the Allies in France. At the time Pte Woodhams enlisted, shortly after the outbreak of war, his father resided in Cambridge Street but he has since left the neighbourhood. Pte Woodhams was working at the B.T.H until within a short time of his enlistment. TWO LOSSES IN TWELVE MONTHS. Official news was received by Mrs Dodd on Saturday that her son, Corpl E Dodd, of the 5th Oxford and Bucks Light Infantry, was killed in action on October 16th. Corpl Dodd, whose home was at 11 Bennett Street, joined, the regiment when the war broke out. He formerly worked at the Gas Works and subsequently for Mr Young, contractor. He was 37 years of age and single. He became a smart soldiers and five weeks after enlistment was made corporal. Although he joined in August, 1914, he did not go out till October 1st, and he was killed on the 16th. On the 20th October last year his father died from the effects of an accident, so that Mrs Dodd has sustained two heavy losses within the twelve months, and the greatest sympathy will be extended to her. The great efforts to secure recruits for the Army inaugurated by Lord Derby it now in full swing locally. Sub-canvassing committee rooms have been opened in the various wards, the blue cards were issued on Monday, and canvassing commenced the same evening. The voluntary system is now on its trial, and only three weeks remain in which to prove whether it will or will not suffice to give up the number of men required to carry the war to a successful issue. To make the scheme a success every eligible man who can be spared should enlist, either for immediate service, or in the reserve, and it therefore behoves everyone to ask themselves whether the reasons which the held to be valid for not enlisting are not, after all, mere excuses. Rugby has already done remarkably well—few towns have done better-but there are still many young men who could well be spared and who have no legitimate excuse for holding back, who should answer to the call ; and the fact that the single men are to be called on first will doubtless assist many married men, hesitating between two duties, to make a decision. So far, the result of the canvass has been disappointing, and eligible men have not responded to the call with the readiness which was at one time anticipated. Only a few men have, so far, enlisted under the group system. The only regiments which are open at present are infantry of the line. The groups in which recruits may place themselves are for single men numbered 1 to 23, for each year of age respectively, from 18 to 40; and for married men the groups are numbered 24 to 46 inclusive for ages respectively 18 to 40. The following have enlisted during the past week :-W J Timms, G Beck, A Frisby, S H Garlick, B Hardy, T C Manby, E C Long, J R M Cave, R.G.A ; T W Rennison, 13th Batt E Yorks ; L A Fudge, H W Driver, R.H.A ; P Smith, W Nown, W J Dunkley, G Baker, C Allen, G Hollis, R.F.A ; E G Bristow, W G Heighton, H C Robinson, W J Riley, F J Hornby, A Varney, A Richardson, R.W.R ; C P Croft, C T Newcomb, K.R.R ; A Varney, 220 F Co, R.E ; J Masters, Coldstream Guarda ; W Parrett, F C Warren, C W Maycock, G Blundell, R.E ; J O’Brian, and J Webster, R Scots Fusiliers.